A Romantic Catholic bishop resigned after a love affair with a married parishioner(both above). 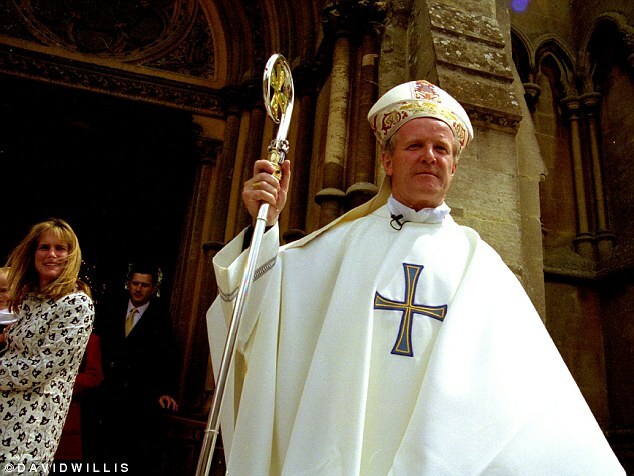 63 year old Kieran Conry, the Bishop of Arundel and Brighton, resigned last week after the estranged husband of one of the women with whom he was said to have had a relationship threatened to sue the church. I've never regretted being a priest. I've never felt unhappy, I've enjoyed it and tried to do whatever was asked of me. 'I've always gone where I've been sent and I hope to do the same again. 'When a priest makes a promise of celibacy, he promises to remain unmarried, that's all. Then the ordinary rules of morality apply. A second love affair six years ago also came to light and yesterday there were claims of a third woman in his life. Mr Hodgkinson realised his wife was being unfaithful when she failed to turn up for choir practice at their local church. The City executive said: 'I thought it was odd when she didn’t arrive at choir practice because normally she would never miss one. I went to her house to drop some music through her letterbox but she wasn’t at home. ‘By then it was about 10pm and I thought it was really weird. I decided it was time to test my suspicion that she was having an affair. ‘I went up to the bishop’s residence and her car was there. I checked and it was there all night. I was devastated. ‘I thought the bishop was someone who was honest and liberal. He is a man who has trained marriage counsellors – and is someone I had seriously thought of turning to for advice in relation to my own marriage.